Designers working on the game "Super Snowcross" used data from NASA's Terra spacecraft alongside in-house software to create hyper-realistic terrain in the game. NASA data is helping video game companies create hyper-realistic snow-capped mountains for you to shred on. NASA's Terra satellite launched in 1999 to help scientists better understand how Earth's atmosphere, land, snow, ice, ocean and energy are connected; to reveal how the climate is changing; and to show human activity and its effects all over the globe. One instrument aboard Terra, the Advanced Spaceborne Thermal Emission and Reflection Radiometer (ASTER), has served an additional, unusual purpose: making video game terrain more realistic. EA built full-featured courses on top of ASTER's data for "Super Snowcross." For example, you can see landmarks in the terrain, like an abandoned nuclear power plant in Siberia over the mountains. "The series has always been big, crazy, and over the top, and we wanted to deliver a massive amount of content by creating entire landscapes," Todd Batty, producer and creative director for "SSX," said in a statement. The company uses an advanced, in-house software tool called Mountain Man to generate mountain terrain. However, "as we researched the mountains of Earth and compared them to the ones we were building, ours just didn't have the same character, interesting features or, obviously, the great history that the famous mountains of the world have," Batty said. That's where ASTER came into play. A technical lead and programmer who was working on "SSX" production stumbled upon ASTER's data online — it's freely available for the public to download — and was able to convert it into a format that worked with Mountain Man. 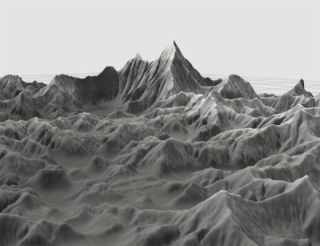 ASTER's data couldn't make up a complete terrain for the game, but the team was able to combined this data with their in-house software, ASTER allowed the team to create stunning, hyper-realistic mountains. "When we found that we could start with what was essentially a real mountain, and then let Mountain Man and our artists build on top of that, it proved to be the last piece of the puzzle," Batty said. "SSX," released in 2012, was the first game in the series to include real mountains. The finished game included 28 real mountains that players could ride down a number of routes. ASTER's data even allowed the team to include detailed, realistic background mountains and real-world terrain in the game. Of course, the terrain in "SSX" is much more than the stunning, realistic mountains. Because the team at EA used ASTER's data as a base layer to build upon, a number of landmarks can be found in the game, built on top of the mountains. These include pieces like an abandoned Siberian nuclear power plant and the Great Wall of China. The use of ASTER data in video game production is not yet a mainstream concept. But EA hopes to use ASTER data in production again, "I know for sure that, if we end up doing another game in the series, we will use the data again, because this was an awesome experience for us," Batty said in the statement. Perhaps other companies will catch on.